Tim Croydon: "What happens if it rains?" We met at Dorking station just after 1800, all geared up for a night in the hills. It was a warm evening, although there was a persistent low cloud base and the promise of rain overnight. I'd given my walking buddy the chance to pull out and we even checked the last trains home - just in case things really turned bad early on. Escape options planned, we hit the footpaths. Heading east from the station, we hit the trails across the southern edge of Ranmore common. Although the sky was overcast it turned out to be perfect walking conditions; warm, but not so much as to break into a sweat and not too humid. As a result we made cracking time through woodland and across lush green pasture before turning south onto the Greensand Way. We passed some stunning Surrey farm houses, wondering whether the beautiful buildings with their colourful rhododendrons and neatly manicured lawns made up for being stuck in the middle of nowhere (well, as remote as it gets round here anyway). The path continued along more fresh green trails through farmland and fisheries, with a decidedly English feel to them. A grassy bank made an ideal location for a quick packed dinner, just before we entered the woods of Squire's Great Wood as the light started to fade due to cloud. Headtorches came out shortly after, as the thick trees and gorse closed around us and the thickening cloud and lack of moonlight left us otherwise in near pitch black, despite it only being 2030 in August. Still, good time was made and so we decided to head down into Coldharbour for a nightcap. If you're in the area, the Plough Inn is worth a visit. It has a good selection of real ales, including some from their own Leith Hill Brewery and has always been welcoming. The warmth of the bar and the relaxing effects of a couple of pints made it difficult to get the packs back on. One of the locals eyed up our gear and asked if we were headed up the hill for the night with a grin as the barman offered us a B&B room for the night. "No, no", we assured them, "we'll be fine!" In hindsight, £69 may have proved to be a worthwhile expenditure! Within seconds of leaving the pub the drizzle started. Whether it was the forecast coming true, or because we were walking up into the cloud, by the time we reached the summit it was bucketing it down. Sideways rain, driven by the wind that had picked up over the crest of the hill started to make things rather unpleasant. Surprisingly, perhaps the biggest difficulty was the lack of visibility - too dark without torches, too much glare off the rain and fog with them. Whether on high or low settings, the moisture in the air was seemingly impermeable to light, leaving us to choose possibly the worst possible location to bed down for the night. Mr Turnbull was not lying. If it rains, you get wet. Very wet. 0400 - I wonder if we could just get up now and walk? Can't be worse than this. 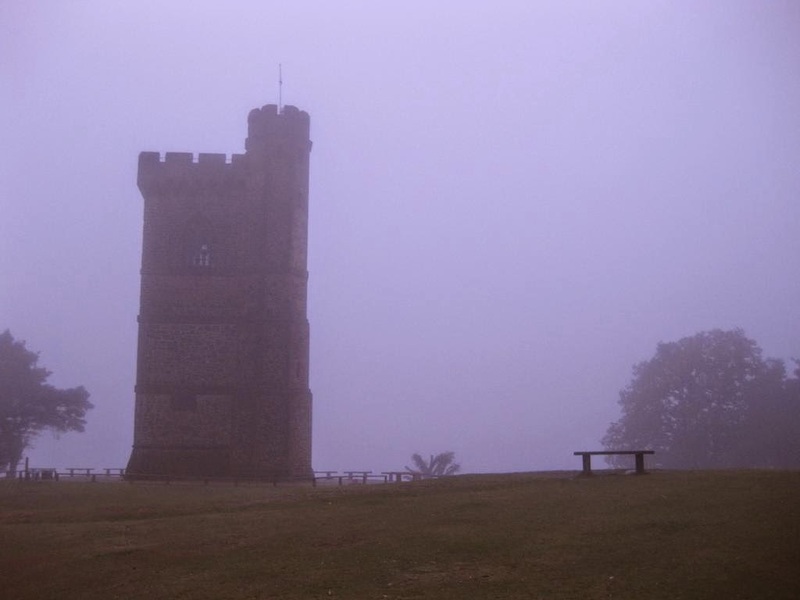 Finally, the drizzle eased up, just as the grey light of morning allowed us to see Leith Hill Tower for the first time, despite being within 50 metres of it all night. Still, with dry pants and socks on, the walk down the hill and across to Holmwood station was surprisingly pleasant, with what was possibly the worst night's sleep I've ever had already starting to feel like a surreal dream.